Are you looking for a strategy tool to help your students who struggle to identify the main idea and supporting details in fiction and nonfiction text? Check out the Two Column Notes Organizer! 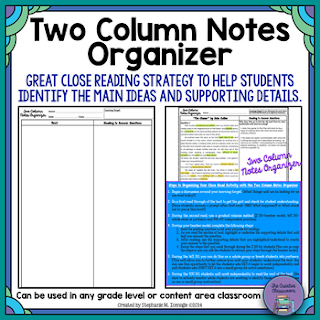 This product contains everything you will need to implement the two column notes organizer into your classroom. All you have to do is insert your own text and questions onto the organizer. This organizer will help struggling students in any grade level or content area to identify the main ideas and supporting details of any fiction or nonfiction text. 1. Two different versions of the two column notes organizer. 2. How to set up your organizer BEFORE the lesson. 3. The steps to implementing a close read activity with the two column notes organizer.